(Bee)autiful Blessings: 30 BEFORE 30 | Final Check-In!! 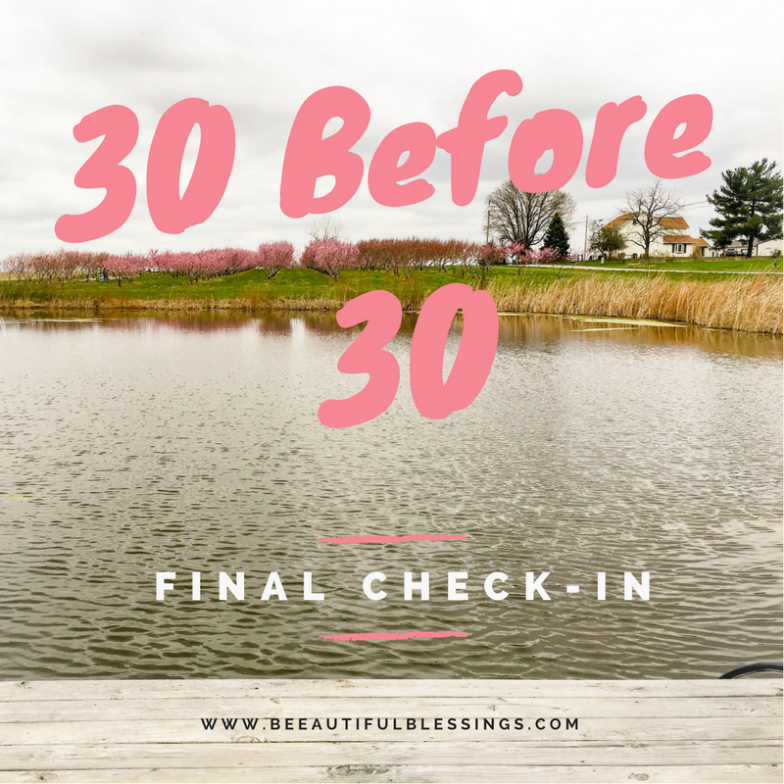 30 BEFORE 30 | Final Check-In!! 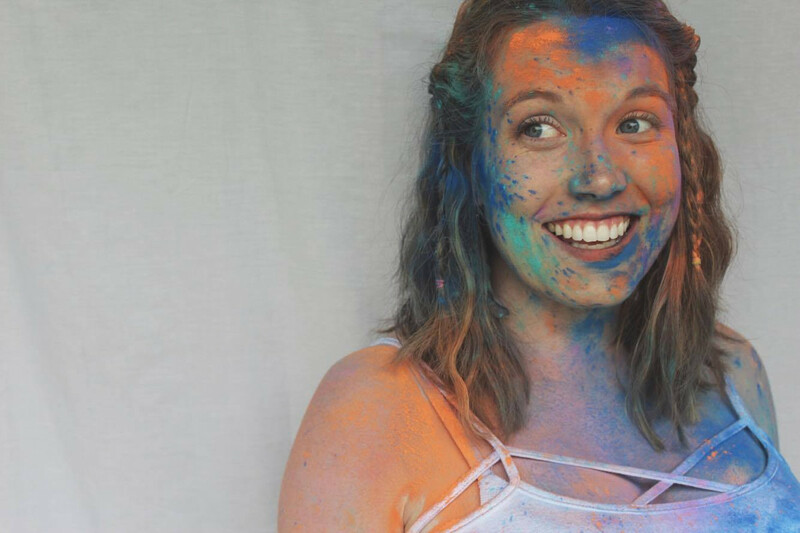 Last week I celebrated my 30th birthday, so I thought I'd use today to share what I managed to check off my 30 Before 30 bucket list and which categories I need to move straight over to my 32 Before 32 list! 30 Before 30: The Final Check-In! 1. Take an international trip | INCOMPLETE After I quit my full-time job, this just stopped being a feasible goal for us financially. Here's hoping we get to do more traveling in the years to come. 2. READ FIFTY BOOKS IN A YEAR | (September 10, 2016) Not only did I hit my reading goal for last year, but I surpassed it. In total, I read 60 BOOKS IN 2016! 3. Submit a grant proposal | (June 2017) I wrote and secured two grants for my Farmers' Market! We were able to kickstart some amazing new programs to outreach to low-income seniors and families in my community and it was such valuable experience. 4. Get my third (and fourth?) tattoo | (October 8, 2016) As a birthday present to my younger sister, she and I got matching Madeline tattoos that we've been wanting for years. We knew we wanted to get some kind of tribute to our childhood, but it took us awhile to decide what we wanted. Our Madeline tattoos are a reference to a computer game that we loved to play as kids and have a whole bunch of inside jokes associated with. Almost two years later, I'm still in love with my tattoo and I love what it represents. 5. Take a kayak trip | INCOMPLETE I did plan one a couple summers ago, but at the last minute Chuck's work schedule wouldn't allow it, so we ended up cancelling. 7. LIVE WITH MY SISTER | (June-July 2016) By some kind of divine intervention, right when it looked like we would have absolutely no childcare arrangements, my sister graduated with her Master's and lived with us for about a month while she job hunted for her first big girl position. That month was way too short-lived and Charlie was still asking for her months after she moved out. We loved having her with us and miss her like crazy. 8. Visit a new state | INCOMPLETE Kentucky wasn't technically a new state, but I did take a few trips to Newport (across the river from Cincinnati) in this timespan. I even visited a distillery with my college besties came to town. 9. Grow my blog | (April 2017-present) I really should have set a concrete, measurable goal for this. I don't know exactly where that magical stopping point is that will make me feel satisfied. However, I will say that April 2017 (followed closely by January 2018) was the best month in terms of total pageviews that my little blog has seen in its 8-year lifetime! 10. Volunteer more | (February 2017) Last February, I started volunteering as Campaign Treasurer for a local woman running for city council. She ended up dropping out of the race for personal reasons, but it was fascinating getting to see how to run a political campaign. 11. Attend regular yoga classes | INCOMPLETE I think I attended one yoga class in this time. It's definitely something I'd still like try my hand at. 12. Finish designing and decorating one room in our house | (May 2017) They didn't end up being the rooms I had originally planned, but I finished our dining room and Crosby's nursery/guest room! Two down, several more to go! 13. Learn a new skill | INCOMPLETE Before I acquired my part-time jobs, I had been taking some coding courses online. I haven't had the time to commit since then, but it's something I still think would be such a valuable professional skill to add to my resume. 14. Baby Pep 2.0 | (September 5, 2016) OUR SECOND LITTLE ONE joined the family back in September. This is obviously my proudest accomplishment. 15. Do something BIG for our 5th anniversary | INCOMPLETE There's always next year, right? 16. Open up a college savings account for Charlie | (July 2017) I finally did it! It's pathetic how long this took me, but I decided one day that I could bite the bullet and do it or keep procrastinating. I was tired of putting it off, so I went to our local savings bank and opened an account for both boys. Hooray for being a semi-responsible parent! 17. 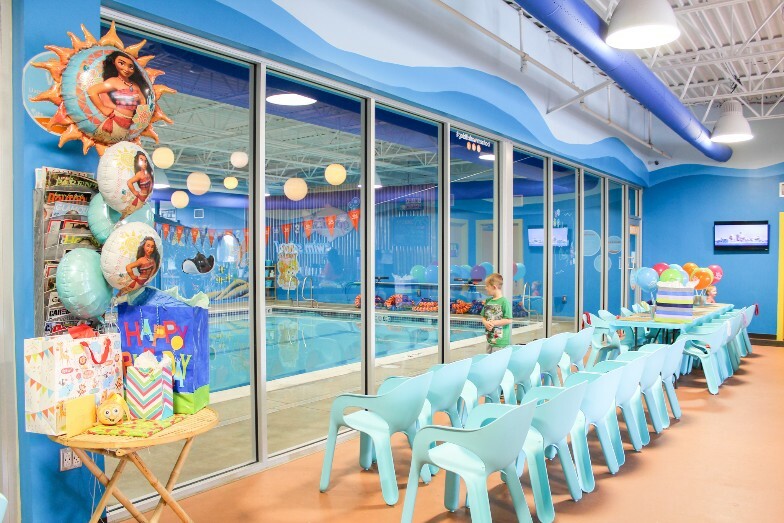 HAVE A GIRLS' WEEKEND | (June 17, 2016) Last summer, I made the haul to PA to visit with my college besties and enjoy some time on the Jersey shore. Unfortunately, no adult beverages were consumed on my part because I was 7 months pregnant with Crosby at the time. But it was an entire weekend of baby-free time, so I'm counting it! 18. Invest in a DSLR | (December 28, 2017) I didn't even need to end up investing in one, because I actually WON a DSLR! The company I worked with last year for my sponsored posts had a giveaway contest. I wrote an essay and was one of six or seven bloggers selected to receive a Canon EOS Rebel T5i . I literally called Chuck to freak out because I was so stinking excited that I would finally get the DSLR I've wanted for years! 19. Run a half marathon | INCOMPLETE The bad news is, I didn't check this one off before I turned 30. The good news is, I'm training as we speak and should be checking it off by the end of 2018! 20. 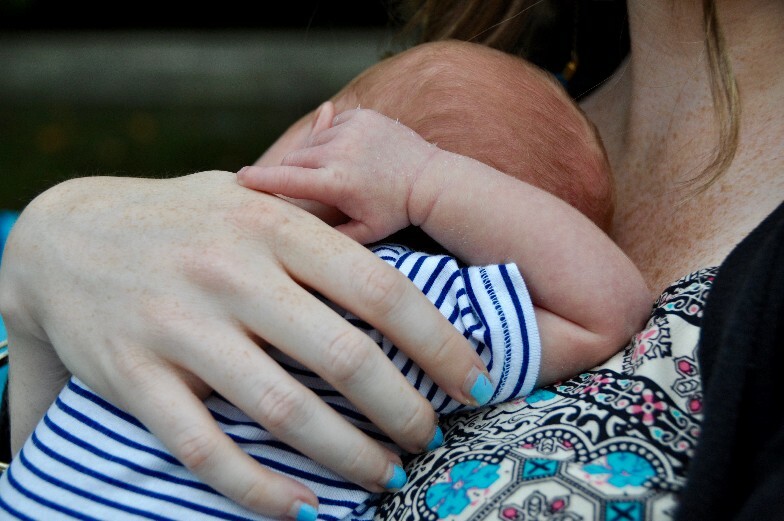 Finish Charlie's baby book | INCOMPLETE Such a Mommy fail. I'm so bad at keeping up with these. 21. Do a Wine & Canvas night | INCOMPLETE This is another category that I just barely missed! I didn't manage to squeeze it in before my birthday, but I'll actually be doing one this weekend for my friend's bachelorette party! 22. Attend a game | INCOMPLETE We had a couple instances when we could have attended a Dayton Dragons game, but every time something would come up last-minute that kept us from being able to. My employer is actually planning a networking night with them later this summer, so I'll be able to check this one off in a few months. 23. Visit FRANKIE'S grave | INCOMPLETE This one is happening, no matter what. It's just a matter of when. 24. PLANT A BACKYARD GARDEN (March 23, 2017) I wound up buying most of my produce at my Farmers' Market, but we grew a small amount of spinach, kale and lettuce. 25. Dye my hair a fun color | INCOMPLETE I haven't had the time or money to do this since I made my initial goal, but I'm not scrapping it by any means. 26. Go to King's Island | INCOMPLETE I never did make it to King's Island before my 30th birthday, but I'm hoping to this summer! 27. WEAR MY WEDDING DRESS AGAIN | (December 19, 2015) Three Christmases ago, my friends had a masquerade-themed birthday party where I went fully decked out in a Day of the Dead-inspired ensemble. 28. Get promoted | (June 19, 2017) I don't know that this really counts as a promotion since I quit my full-time job in November 2016. However, I went from being a "Coordinator" at my old job to a "Director" at my current position, so I like to think that counts as a promotion. 29. Attend a book signing | (August 20, 2017) After I chickened out several years ago from attending her book signing when she came to my town, I refused to squander the opportunity a second time. In August, Glennon Doyle came to Columbus to speak, and though it wasn't a book signing, I'm counting it. Glennon has been and probably always will be my favorite blogger and author. Getting to see her "live" was such a gift. 30. Give my husband 3,000 kisses (April 25, 2018) I mean, I'm guessing here, but I like to think I accomplished this one! I managed to complete just over half of my pre-30 goals. I wish I could have done more. But a lot of the ones I didn't check off my list are going to carry right on over to my 32 Before 32 bucket list! Check back later this week to see what I hope to accomplish before my 32nd birthday! Do you have a milestone bucket list? What has been the hardest thing to accomplish?